Delivering an outstanding experience to your guests is central to your business but communication plays a key role in this, ensuring they get the right information at the right time. It can influence their spending habits, impression of your property and help keep them playing for longer. 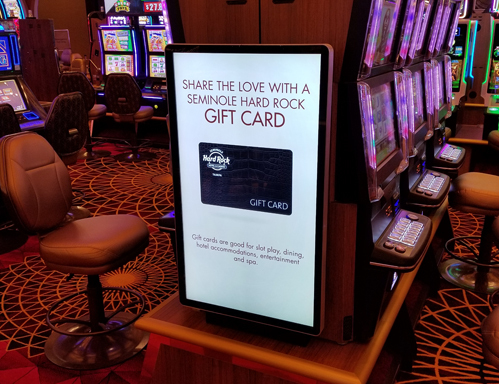 Digital Signage is a great vehicle to delivering on your communication strategy and ultimately giving your guests an outstanding experience, from jackpot totals to information on services available on site such as bars and restaurants we have the technology to really ensure your message stands out! 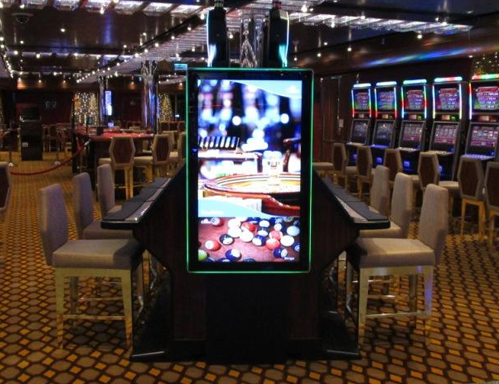 For any casino the use of digital can almost be limitless, many leading casinos around the world have chosen a TOPAZ Digital solution and below are a few examples of how you may wish to deploy our digital solutions within your property. With its patented blue HalO™ our 10” table sign enables you to display both table information and dynamic advertising messages seamlessly. 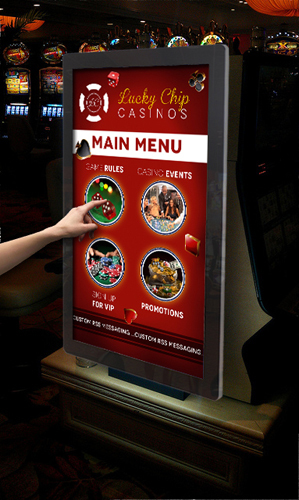 Built as a simple to update [via USB] display ensuring you have a low cost but high impact solution which is the perfect complement to any table game in a property. 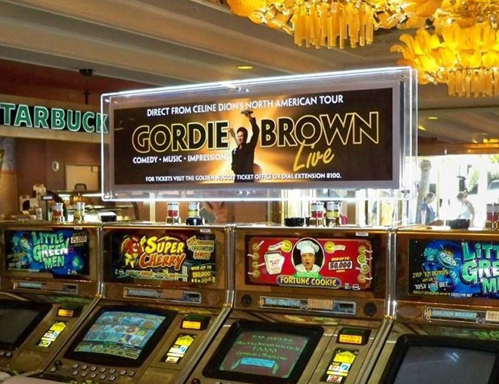 Perfect for a cost effective End Cap solution to showcase your promotions, with over 10,000 units deployed across casinos around the world this has been a popular product choice for many casinos. The illumination is by way of a specially tooled optical panel which spreads the light evenly across the face of the image. The edge of the frame is laser cut at 45˚ which creates the unique HalO™ effect around the perimeter. 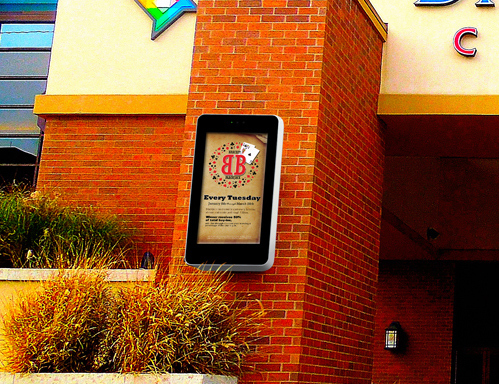 This HalO™ effect draws the eye to the frame and to the image displayed within it to create an eye catching, high profile illuminated display suitable for any environment. Mirrored on our stunning ASL range delivering true tablet like aesthetics including rounded corners & brushed aluminium edging our VSL range feature all the design qualities but without price tag. Designed to deliver a cost effective but highly impactful end cap solution the display incorporates a 43” commercial grade IPS panel including a 3 year warranty equipping you with a high impact display to connect your existing media delivery system to. 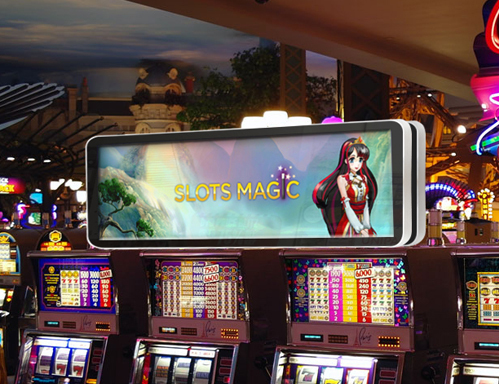 For casinos looking for a more contemporary aesthetic approach our TOPAZ SL range offers striking tablet style designs with all the power and functionality to provide networked ‘Out of the Box, Fully Inclusive’ digital signage. 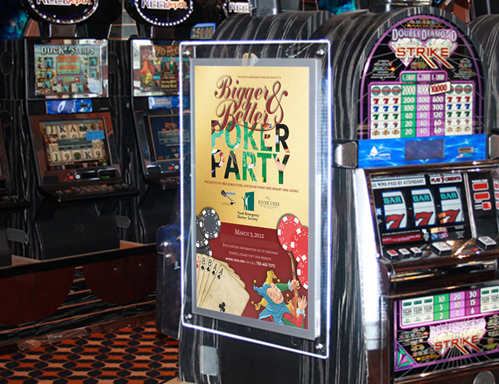 The perfect use of the end cap space available to add far more than a simple poster, the ability to add dynamic graphics enhances excitement within the casino and can boost cross sell of other services such as your bar and restaurant. Featuring our patented HalO™ of light our HalO™ VLS range provides the POP for your message that our HalO™ displays are known for but equally deliver a highly cost effective solution making use of your existing media delivery system enabling you to connect easily via HDMI. Incorporating a 43” Commercial grade IPS panel you get a great quality display with the design qualities of something truly unique! 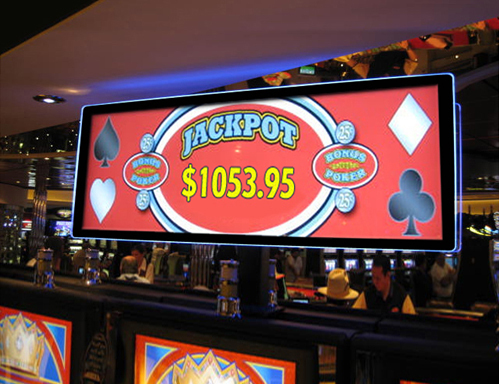 The color changing HalO enables you to draw maximum attention to your message and elegantly frames your content in light, a truly unique display that is widely selected within the gaming industry. 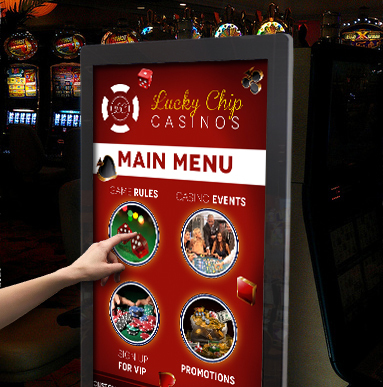 For casinos looking for a more contemporary aesthetic approach our TOPAZ ASL range offers a striking tablet style design with all the power and functionality to provide networked ‘Out of the Box, Fully Inclusive’ digital signage. However with our ASL range we not only provide a stunning design but all the tools you need to deliver networked signage through the integrated media player and access to the TOPAZ CMS software platform meaning that you can update and remotely manage your displays from anywhere in the world….all included in the price! 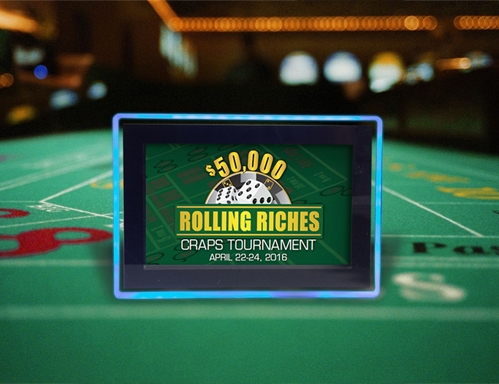 Replacing the tired looking cardboard toppers so often found within casinos with our Light Box Slot Topper is an extremely cost effective way of significantly uplifting the look & feel of a bank of machines. Providing an eye catching illumination and available as both single and double sided you instantly draw more attention to your message! When you want to draw maximum attention to the top of your machines but for a fraction of the price of a fully custom topper our HalO™ Slot Topper is a winning solution. 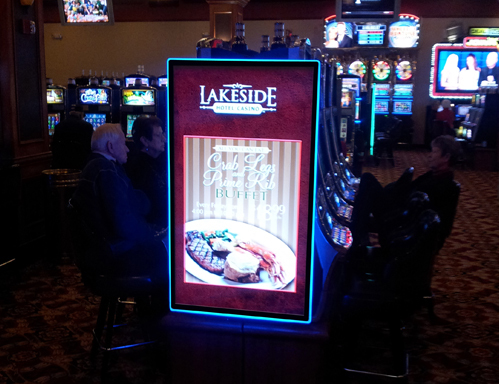 A full digital display framed with our patented HalO™ of light you are able to display dynamic content in an eye catching and effective way. Available in a range of sizes and as single or double sided you can either connect into an existing media delivery system or choose the TOPAZ CMS platform to deliver not only great design but a powerful fully networked display. 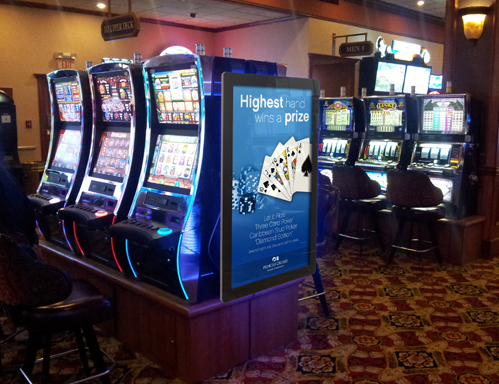 Our new Ampia™ Slot Topper delivers a contemporary design that is both elegant and ensures your message POP’s, designed around our VSL and ASL displays we deliver a true tablet like design for your slot topper display! Available in a range of sizes and as single or double sided you can either connect into an existing media delivery system or choose the TOPAZ CMS platform to deliver not only great design but a powerful fully networked display. These ultra high bright displays really make the content POP which when combined with the tablet finish creates a talking point for your message. Turn your end cap in to an immersive experience for your guests by adding one of our interactive displays as an end cap solution. Either run your existing software or allow us to develop your own custom interactive software enabling you to provide your guests with what matters most to you. From game rules to players club’s anything can be at the fingertips of your guest and enables you to provide far more than just advertising, you are providing valuable informative information that they want to see. 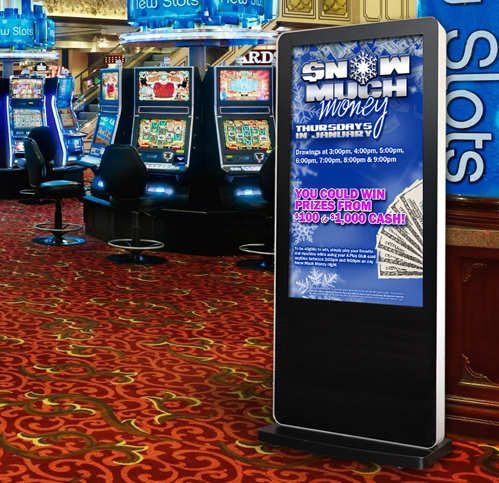 Our Flagship Freestanding product provides a focal point for any digital communication, offering striking design and feature packed functionality plus with no installation required you can quickly deploy an eye catching focal point around your casino. Designed to operate exactly like the wall mounted SL range which is utilized for end cap deployments our Freestanding range offers that extra special design quality that ensures it gets noticed. All the same design qualities as our Freestanding broadcast displays our Freestanding touch offer the added benefit of 6 point multi-touch technology. Either combine with your own software or allow us to develop a custom interface for you, just like the interactive end caps these displays offer you a chance to get closer to your customer and put them in control of what it is they want to see. 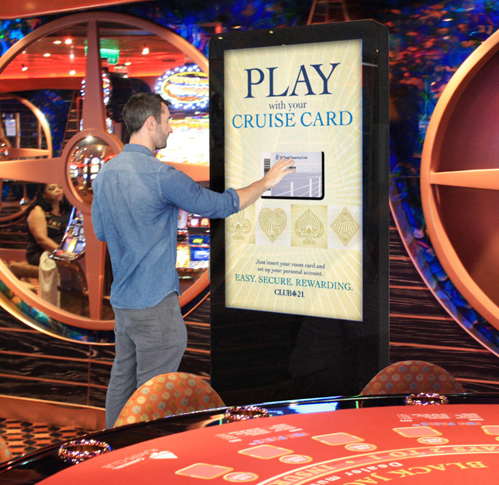 More than just a communication tool you are able to engage with your guest and have them sign up to your players club or redeem points, locate their favourite slot on the floor or pull up your restaurant menu… the possibilities are endless but whatever functionality you choose the TOPAZ Freestanding interactive display is a great vehicle to drive your communication. A guests journey starts before they step foot in your property, ensure your messaging and communication starts off as they approach with our Outdoor SL Range. Our outdoor range combines all the benefits of our Android SL displays with the added benefit of being housed in a robust IP65 rated enclosure ensuring your message can be broadcast regardless of the weather. The displays themselves are sunlight readable, fully weatherproofed and able to operate up to +50◦C or down to Minus 50◦C with the additional heater. So whatever the weather you can be sure of reaching your customers wherever they are & as our Outdoor displays use the same CMS platform as our indoor displays you can control your entire network both indoor and outdoor from the same control panel. When deploying an interactive solution there is no substitute for a custom designed platform that embraces your brand and harnesses the functionality that is most important to you. Every project we undertake starts with a blank piece of paper and in establishing your goals and objectives we are able to build up a storyboard to illustrate how this will work. Our team are there to assist at every step of the way and you will end the process with a fully functioning interactive software platform that is unique to your business. With a custom development solution anything is possible from linking into your existing systems or providing a simpler more informative style application, our team can advise on how we can deliver on your goals.